Why study language? Because learning the basics of language helps you understand your students' needs and to teach reading, spelling, and writing explicitly and systematically. 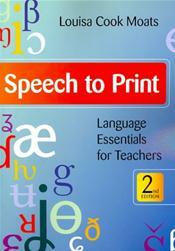 In this thorough and well-written book, you'll understand the organization of written and spoken English, discover the connection between language structure and how individuals learn to read, find helpful chapter exercises and self-tests to ensure you master the language skills presented, get examples of students' writing to help you interpret children's mistakes, encounter sample lesson plans and adaptations that apply the concepts of language you are learning, All of this will enable you to recognize, understand, and solve the problems individuals with or without disabilities may encounter when learning to read and write.